Earlier in the season Geelong would almost have pencilled in tomorrow afternoon’s game against Brisbane as a near-certain four points. The battling Lions were pretty much one of the competition’s easy beats. Fast-forward to round 19 and Chris Fagan’s young cubs are probably the most in-form nonfinals contender in the AFL. Since the bye rounds the Lions have been competitive against GWS, thrashed Fremantle in Perth, demolished Carlton, gave Hawthorn a touch-up in Launceston and ran the Crows to five points at the Gabba. It’s been an impressive comeback. Geelong has been hot and cold. How can you describe last Saturday night’s epic encounter against Melbourne? Down by 23 points at the final change, Geelong snatched a thriller with a Zach Tuohy goal after the siren. Gary Ablett was immense in the final quarter and Tom Hawkins continued his stellar season with a seven-goal haul. Remarkably, though, the win still had the Cats sliding out of the eight on percentage. With five games left, Geelong has three at the relative safety of its GMHBA Stadium fortress, including this one. Put simply, tomorrow’s game is a must win. Next Friday night, Geelong takes on the league juggernaut, Richmond, at the MCG. There is no greater challenge in the AFL today than the Tiges at the home of footy. If the Cats win their remaining games at Kardinia Park (and they should – Brisbane, Fremantle and Gold Coast), it should be enough to get them into the eight. But if the Cats want a top four spot, they need to win, and keep winning. Brisbane is the most improved side in the comp over the past month and a half. Alex Witherden’s form has escalated him into Rising Star calculations, while Harris Andrews should be back to take on Hawkins in what would be a one-on-one battle worth going to see alone. 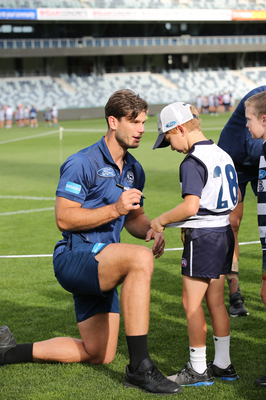 Geelong was buoyed during the week with youngsters Jack Henry, Quinton Narkle and Esava Ratugolea all extending their tenure at the Cattery. “All three players, in just their second seasons, have shown the ability to play good football at AFL level,” Geelong’s General Manager of Football Simon Lloyd said. “When the opportunity has arisen, they have grabbed their chance. Jack, Quinton and Esava have shown a commitment to their football and have heavily invested in the club and the Geelong community. Chris Scott will make sure Geelong doesn’t take Brisbane lightly. He simply can’t afford not to. But at GMHBA Stadium with lots to play for, the Cats will get the job done.